When Hubby and I were cruising the liquor store aisles prior to Christmas, I noticed Crown Royal Maple on the shelf. I was intrigued, but didn’t want to spend the big-bucks on a bottle of whisky without knowing whether or not we would drink the bottle. While out at dinner one evening, I decided to give the Crown Royal Maple a try and ordered a mixed drink. I ended up buying a 1.75 liter of Crown Royal Maple Finished at the liquor store shortly thereafter. Crown Royal Maple Finished came out sometime in 2012. Clearly I am not cutting edge as I just discovered this whiskey in November. Well, better late than never… Crown Royal Maple Finished (80 Proof, $45- $50 for a 1.75L) is amber in color and looks like a light, clear bottle of maple syrup. According to the Crown Royal Maple Finished website, Crown Royal Maple is an exceptionally smooth whisky that masterfully blends the signature caramel and vanilla nose of Crown Royal with a warm and woody maple touch. Hmmm well, I’m not sure I agree with that. First of all, I would advise anyone that dislikes maple to skip Crown Royal Maple. The maple is not a “touch”, it is a sledgehammer. Personally? I love that. I very much enjoy maple in all forms. For me this was a positive, for anyone who is not a fan of the taste of maple, it is going to be nasty. Sipping the Crown Royal Maple Finished: it is maple on the nose, maple on the front end, and, as Hubby put it, “a bit rough on the back end”. Myself I did get a touch of vanilla at the end, but I can’t disagree with Hubby about the rough – there was a true bite. I was a bit surprised by this myself. Right now you are probably scratching your head and wondering why I bought such a large bottle of a whisky I clearly didn’t find smooth. Simple; with a mixer it is outstanding. Crown Royal Maple and Ginger Ale, specifically Verner’s Diet Ginger Ale, has quickly become my new favorite drink. Ginger Ale brings out the very best in the Crown Royal Maple, sweetening it, smoothing it out, and generally enhancing both the Canadian whisky and the maple! The ginger ale compliments the Crown Royal Maple Finished completely. My guess is the Crown Royal Maple would make an excellent ham glaze. The next time we have ham, I will give it a go in a recipe and report back! My opinion – Crown Royal Maple Finished is a delicious whisky when used with a mixer for those that love the taste of maple! • In a tall glass, add 4-6 ice cubes. • Pour the Crown Royal Maple over the ice. 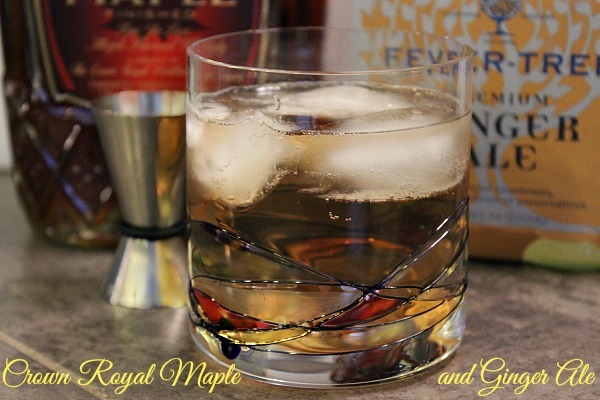 Have you ever tried Crown Royal Maple? Did you enjoy it? If you would like to know where you can purchase the beautiful crystal glass I used in this picture, click here. Yum!! I’ve never heard or seen it either but it sounds like something I’d love.. Im a rummy for the most part but this sounds like it would be a good one for a change every once in a while. I’ll keep my eyes open next time Im in the liquor store. Bet it would be good with Dr Pepper too.. my soda of choice.. it has the vanilla undertones too.. I love Rum & DP.. Yum Yum Yum! If you try it, let me know how it is, Kim … it was gross with sprite. I actually came up with the same Crown Royal Maple and ginger ale combination on my own. Saw the Crown Royal at a bar and thought that might be good. Decided ginger ale would be the best thing to go with it. Much later on I even came up with a name for it. Canadian Breakfast. “Canadian Breakfast” … that made me laugh, Noah.